4 Bedroom Detached House For Sale in Bodmin for Guide Price £535,000. This 4-bedroom executive style property is in a desirable private location backing onto one of Cornwall's premier golf courses. The property has wonderful views of the golf course and backs onto the 18th Fairway. Its own driveway leads to a double garage. Backing onto the 18th fairway of Cornwall's renowned Lanhydrock Golf Club is this immaculately presented and generously proportioned executive home. It comprises two generous reception rooms, four double bedrooms, two bathrooms, a double garage with ample off street parking and a substantial garden that backs onto the golf course. Constructed in the early 2000's by multi-award winning Charles Church, this prestigious property offers a superb blend of contemporary design and classical features. Generously proportioned accommodation complements wonderful views across the golf course. To the front of the property, a large area of briquette paved parking, bordered by dry-stone walling and attractive planted borders, gives access to the double garage with electric up and over doors One enters the property through a spacious hallway with stairs leading to the first floor and elegant spacious landing above. The entrance hallway leads to a large, dual aspect sitting room with feature fireplace with gas fire and French doors leading out onto a delightful conservatory which in turn looks onto the rear garden. Immediately on the left in the hall is the second reception room which is ideal for a snug, office or study. The superb kitchen which has been re-fitted to a very high standard in recent years has a wide range of wall and floor mounted units that are crowned by stone worktops. This fantastic kitchen/breakfast room has French doors that lead to the rear patio area which is a delight in summer for alfresco dining. Completing the ground floor accommodation is the down stairs WC. The aforementioned spacious landing on the first floor opens out on to the four, double bedrooms and the family bathroom. Two of the four bedrooms feature a range of built in wardrobes whilst the master bedroom also has en-suite bathroom facilities. Both the family bathroom and master bedroom en-suite have been totally re-fitted and now provide modern and contemporary suites finished to a high standard. Two of the bedrooms have beautiful views of the golf course. The property is situated on the golf course side of the cul-de-sac and has its own beautifully maintained and arranged gardens to both the front and rear. The garden provides features such as the paved patio area that is perfect for out door entertaining for a good sized party. The level lawed garden is bordered by mature shrubs and plants and the bottom of the garden has a storage shed and separate potting shed. There is convenient access to the double garage via a rear door which is only metres from the kitchen which is perfect for bringing in the shopping. In all this is a luxury home located on arguably Cornwall's leading golf course development. The property nestles in a charming position abutting the Lanhydrock Golf Course. The property offers a low maintenance yet luxurious lifestyle with access to many leisure pursuits and road links out of the County. Near by is Lanhydrock House the restored Victorian mansion now owned by the National Trust. For keen golfers, the Lanhydrock Golf Course is well regarded. 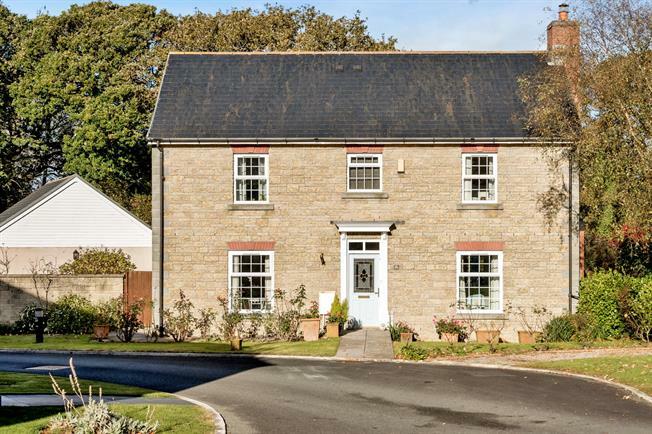 The former County town of Bodmin is some 3 miles distant which offers an excellent range of facilities including shopping, schooling, churches and a main line rail link to London Paddington from Bodmin Parkway. Cornwall's distinctiveness comes from its historic landscape and spectacular coastline, long stretches of white sandy beaches, tree-lined creeks and rugged cliffs combine to create one of Europe's most desirable playgrounds. Property is excellently situated close to the main A30 within the centre of the county with easy access for exploring the beaches of the spectacular north Cornish coastline at Padstow and Rock, and water sports at Fowey and St Mawes on the South Coast. It is equally well placed for access to the walks and hiking to be discovered on Bodmin Moor. The following services are available at the property Mains Electricity; Mains Gas; Mains Water; Mains Drainage; Telephone and Broadband connectivity, although we have not been unable to verify connection at this time. Council Band 'F'.